Introducing, iDual. A first step into a larger world. The advancement of lighting has been and continues to be staggering, iDual follows suit offering total control at the press of a button. In the busy world we find ourselves in convenience and versatility is highly sought after, our new range of iDual products are here to help. Operated by remote control these savvy lights cater for work, relaxation and play. Available in a range of integrated fittings from exterior lights to desk lamps as well as individual bulbs to fit into your current fittings! iDual is smart lighting in its most accessible form. Most smart bulbs on the market require additional kit from hubs to bridges, iDual does not. Its plug and play feature really is plug and play, simply plug in your lamp or fit your bulb and start controlling it from the remote control to light up your world in a vast array of colours. Colours include the standard warm white for average household lighting as well as a cool white for work mode. Perfect for any room in the home or office, every moment has its light. All iDual products are operated by the iDual remote, this is purchasable separately but also comes complete with select packs *see product descriptions for details*. The options shown on the control are all presets which are in built to all iDual products. 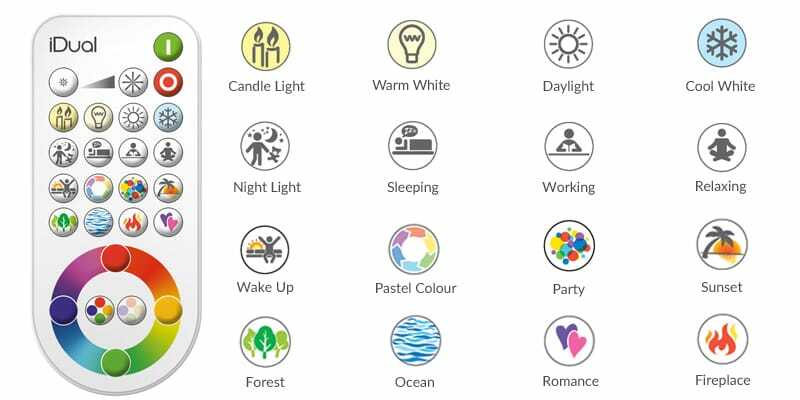 As shown in the above image the iDual remote has an on and off button, dimmer options, colour wheel options, saturation options and 16 preset modes. For a quick look at the effect each mode gives see the below video. The option of changing the ambiance of your room is hugely beneficial. You may not want to arrive home from work and be greeted with a stark white light, so switching it to the delicate flicker effect of the Fireplace preset may just be the thing to settle down. The iDual range can be purchased as individual bulbs, packs of bulbs or as integrated fittings including ceiling lights, table lamps, cabinet lights, outdoor lights and more. Jasmine is one of the iDual desk lamps which is integrated with the iDual bulb technology, comes complete with a remote control and USB charging port for your portable devices. Perfect for bedroom, lounge or office lighting in a modern setting. For those who wish to implement iDual into their homes without replacing entire fittings can do so by simply acquiring the iDual smart bulbs, available individually or as a pack. Not only is iDual beneficial and functional for the home but it’s also a great gift idea! 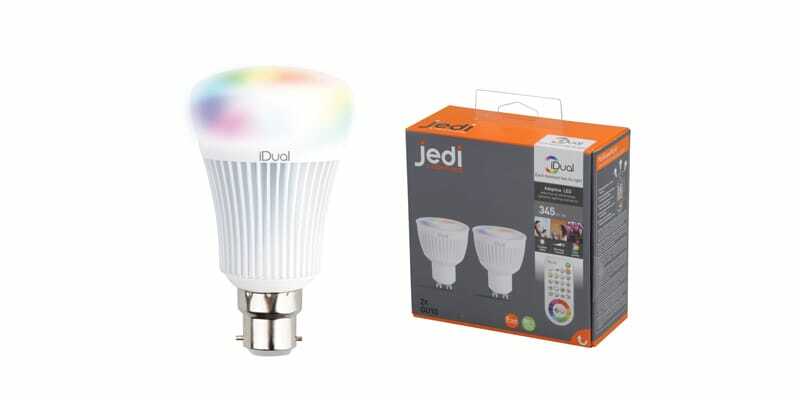 If you find yourself wondering what to get this kids for Christmas this year then control over their bedroom lighting and it’s colour is certain to go down well!